Do you have a first generation iPod Nano that’s on its last legs? 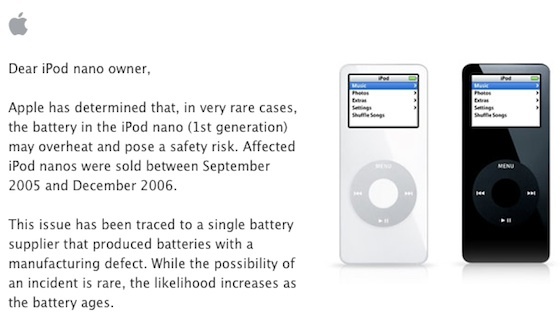 Well good news for you Apple has announced a replacement program to address an issue (in “very rare cases”) which may cause your Nano to over heat and possibly cause serious safety risk. Apple recommends that you stop using your iPod Nano immediately and follow the process directions to receive your new iPod Nano free of charge. Those of you with the first generation Nano can fill out a claim form to confirm eligibility for a replacement. Click below to see the full press release. It has a black or white plastic front and a silver metal back - later iPod nano models have a metal front and back. Thank you for participating in this program.